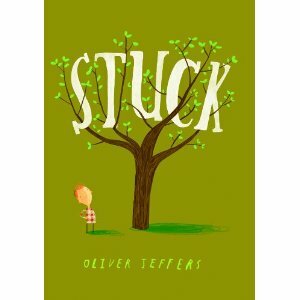 I came across Oliver Jeffers when I selected his picture book Lost and Found as a read-aloud for preschool storytime. I was immediately charmed by the simple illustrations that could convey so much from a tiny penguin. When I saw the follow-up, Up and Down I think I was just as excited (if not more) than the children. I really love the pairing of a penguin and his friend the boy. Now, I am excited about his book Stuck. Anyone who ever got something stuck in a tree (in this case, a kite) can appreciate this book, as well as the increasingly silly reactions that follow the kite’s unfortunate entanglement. First, a shoe is thrown. Good idea, right? Nope. It joins the kite, followed by the other shoe and a wildly hilarious collection of other objects. Will the kite become unstuck? Read and find out! Oliver Jeffers is an Irish writer and illustrator currently living in Brooklyn, New York. According to the author’s website (www.oliverjeffers.com) He is widely known for his picture books for children, published by HarperCollins UK and Penguin USA. How to Catch a Star debuted in 2004 to critical acclaim, and Lost and Found (2005), won the Nestles Smarties Book Prize Gold Medal 2006, the Blue Peter Book Award 2006 and was shortlisted for the Kate Greenaway Medal the same year. The Incredible Book Eating Boy (2007) won the Irish Book Awards Children’s Book of the Year. If all of this doesn’t convince you, then go find an orangutan and throw it in a tree. You’ll appreciate Stuck even more. This entry was posted in Books by S.D. McPhail. Bookmark the permalink. I always think it’s a sign of an original mind that can take something small and apparently trivial and turn it into something charming.